Responding to an emergency call is like a box of chocolates; you never know what you’re going to get. 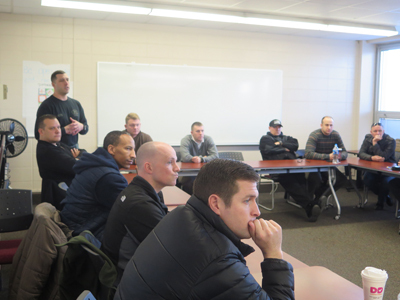 To help prepare law enforcement agencies for the unexpected, the Montgomery County Sheriff’s Office Bomb & Hazardous Device Disposal Unit recently held a collaborative, three-day training at Arcadia University to help officers detect and handle booby traps. Approximately 80 law enforcement officers representing the Pennsylvania State Police, ATF, Philadelphia Police Department, FBI, and SEPTA took part in the training. Each day started with an hour-long presentation by MCSO Bomb Unit Dep. Andrew Noto and Philadelphia Police Department Bomb Unit Detective Timothy Brooks, with assistance by MCSO Bomb Unit Commander Lt. Allen Stewart. Dep. Noto walked officers through a variety of explosive traps, and the tension, trip, and pressure releases by which they could be controlled. He also covered non-explosive traps such as deep holes covered with debris, trap doors, and a bow and arrow. Unfortunately, most of the materials needed to make booby traps are readily available household items such as soup cans, batteries, and fish wire, which makes detecting traps difficult and justifies the need for heightened awareness. Once a device is made, it needs an action or energy to activate it. Noto talked about how easy booby trap devices can be activated by heat, penetration, vibration, rotation, and magnets. He also emphasized the need for a combination of investigative skills necessary for recognizing traps, such as prior training, adequate light, intelligence information, speed of movement through a scene, and clues. So, it’s very important to handle the scene with care and not get distracted when moving through a potentially booby trapped area. Additionally, marking booby-trapped areas while investigating can be helpful for others who may be working in the same location. “If there is one booby trap, then there are probably more,” Noto said. Lt. Stewart reminded participants that bombs and booby traps don’t only exist in faraway places; they can also be found in what are considered safe communities. He became keenly aware of this fact when his unit was called to a public storage facility in Malvern, Pennsylvania, which held approximately 400 explosive devices that were being stored by someone who was planning to do harm. Det. Brooks also shared his experience working with booby traps. He showed crime scene photos of an incident in which he responded to a call at a house that turned out to be outfitted with 25 booby traps. He emphasized the importance of not disturbing any suspicious areas and to call the bomb squad, if necessary. Once presentations were finished, officers were led to Arcadia University’s Crime Scene House, where participants tried their best to approach and walk through the two-story house and attic without setting off any of the 16 booby traps that had been planted. In addition to the presenters, MCSO Bomb Unit Deps. Ryan Volk and Jon Cagliola and FBI and ATF representatives coached each officer through the approach to the house, through the living room, kitchen, office, and attic areas. Coaches asked participants questions about their investigative strategy and helped them learn how they may have been more successful. Many officers, depending on their prior training, approached the scene in unique ways. SWAT team members are normally trained to force entry in high-stakes situations; others are taught to be more tentative. At the end of the day, many felt that they had learned a lot about how to keep themselves safer when responding to emergency scenes. The common lessons learned were to not become complacent during a search and to call the bomb squad before disturbing any suspicious materials. Teresa Harris is the Public Information Assistant at the Montgomery County Sheriff’s Office.